The conservation of archaeological artefacts often conjures up images of a dusty museum with bespectacled professors cleaning objects with paintbrushes or, in extreme cases, hammers and chisels! This couldn’t be further from the truth. 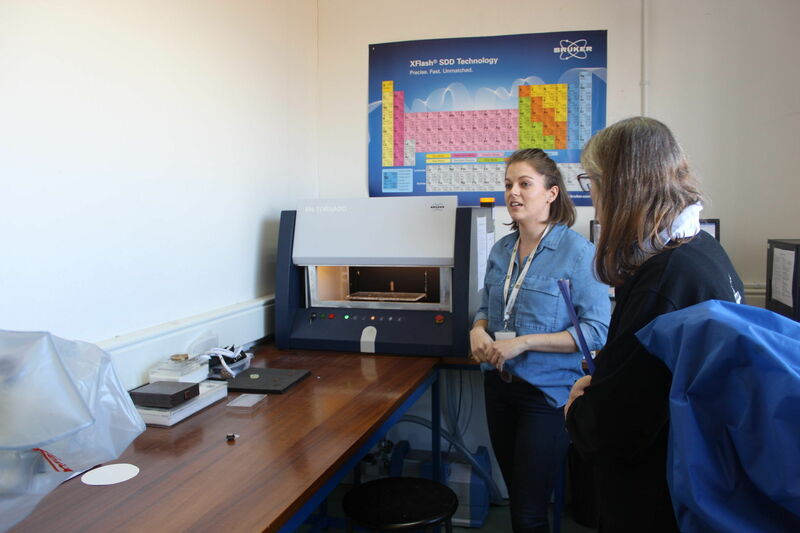 The modern conservation lab is more likely to have freeze driers, air scribes, ultrasonic baths, PEG baths and X- ray fluorescence (XRF) spectrometry machines. I’ve just returned from a course looking at the conservation of artefacts from the Rooswijk, a Dutch East India Company ship that sank on the Goodwin Sands in 1740. Funded by the Cultural Heritage Agency of the Netherlands (Rijksdienst voor het Cultureel Erfgoed; RCE), and, organised by Historic England (HE), the Nautical Archaeology Society (NAS) and MSDS Marine (the UK contractor for the excavation), we were treated to three days of exploring how the artefacts are being conserved, processed and recorded. The three days were a mixture of presentations and hands on practical work. 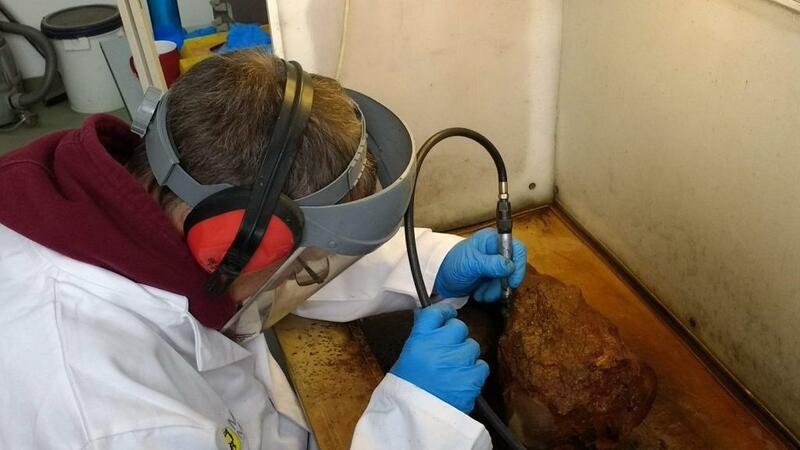 These practical sessions involved us carrying out real conservation work on the artefacts and made you feel that we were “real” archaeologists and conservators. The first day focused on the coins that were recovered. We began by reviewing the history of coins and were lucky to have Jan Pelsdonk, a coin specialist from the RCE (technically he should be called a numismatist, but most of us struggled to pronounce it!). We also looked at the composition of coins and their importance archaeologically, particularly for dating shipwrecks. 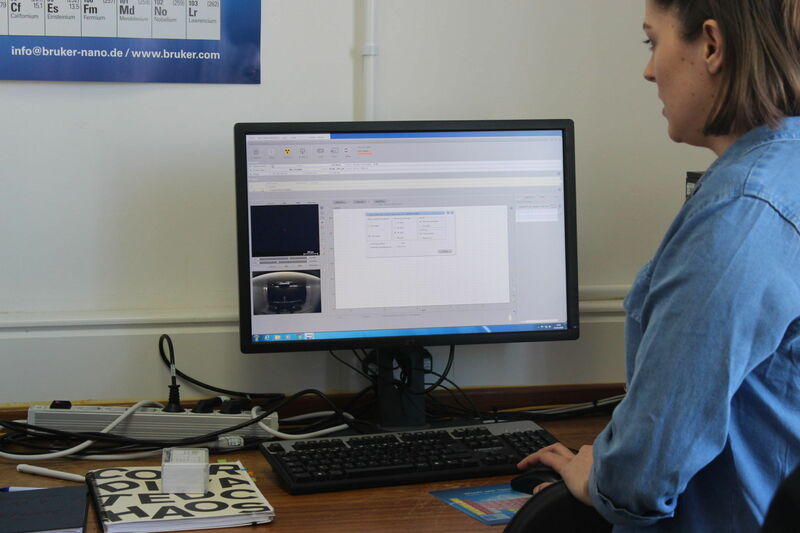 Our tutors for these sessions were Kim Roche and Nicole Schoute, MSDS Marine staff working at Historic England’s conservation facility at Fort Cumberland, and Peta Knott from the NAS. The background sessions led into the afternoon practical sessions where we got involved in cleaning, recording and assessing the coins found during the excavation. 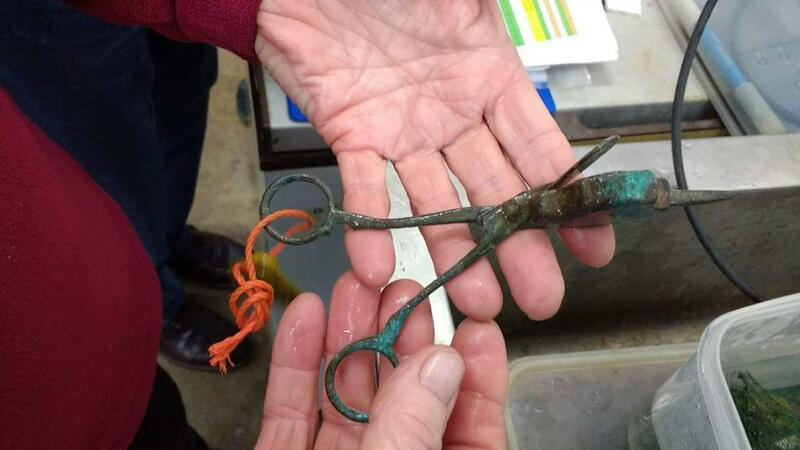 Actually being able to handle and examine the coins really helped build a connection with the wreck and the men who sailed from Holland on that fateful voyage in January 1740. 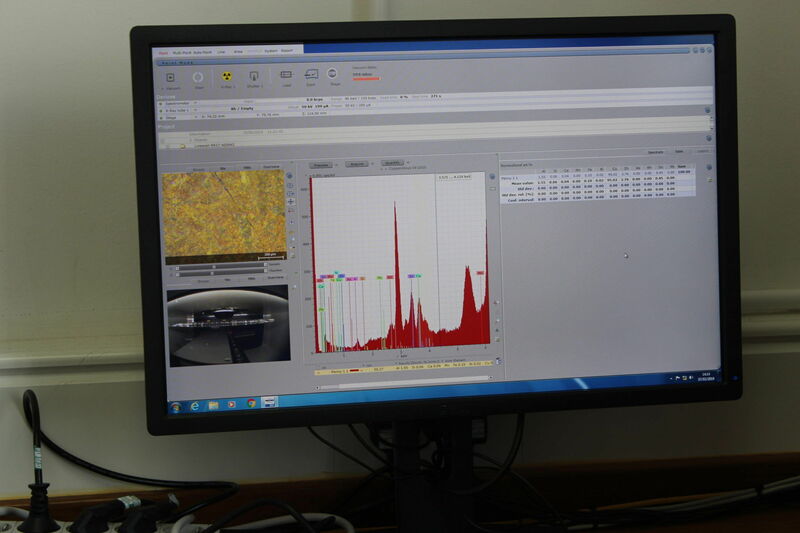 It was fascinating to see the range of techniques involved and it was here that we were introduced to XRF. This a technique that enables you to determine the material composition of an object using x-rays. Using the machine really brought home that the work that Kim, Nicole and their colleagues are doing is conservation science. The walls of the XRF room are decorated with a large copy of the periodic table and it is far removed from the dusty back room in a museum that I mentioned earlier. On the second day we broadened the focus and looked at artefact conservation in general. Kim, Nicole and Peta were joined by Angela Middleton and Gill Campbell, from Historic England. Again after some background theory we got down to carrying out real conservation tasks. 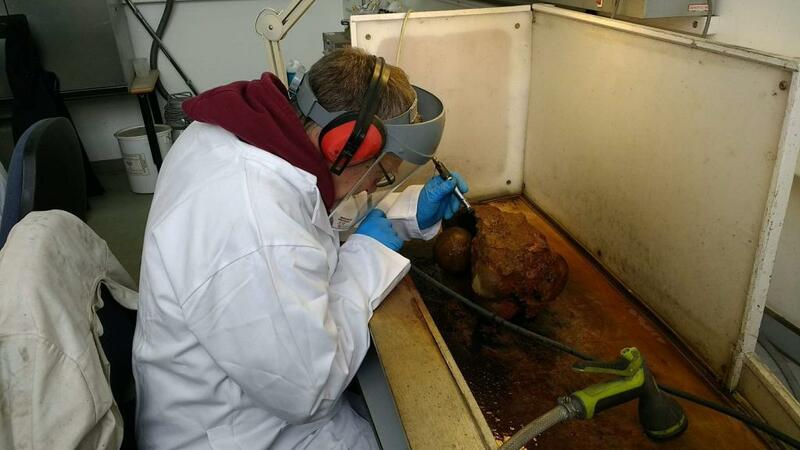 These included reviewing environmental samples; cleaning and deconcreting artefacts using air scribes and air abrasion (similar to sand blasting but with ground up walnut shells), and monitoring the desalination of artefacts. As with the coins, working with real artefacts was a sheer joy. Seeing artefacts beginning to appear out of a lump of concretion was mesmerising and gave you a real sense of satisfaction. We all got so engrossed in our tasks that time flew by. Angela made a lovely comment about how handling and working with the artefacts helped you get inside the heads of the people who originally owned them. On the final day we were introduced to the art of photogrammetry. Perhaps art is the wrong word, science would be more appropriate. As its name suggests photogrammetry involves taking lots of overlapping photographs of an object and then using a computer programme to stitch them together to create a 3D model. The programme uses some complicated maths to match up the geometry of the pictures and even looks at the colouration of individual pixels. Our tutor, Martin Davies, is well known for his work producing photogrammetry for sites such as Norman’s Bay and the Holland 5 submarine. Under his expert guidance we were all, soon producing images of selected Rooswijk artefacts. The fun thing about the programme is that it allows you to twist the artefact around and zoom into parts for a closer examination. As an interpretation tool, photogrammetry really adds to the range of ways in which we can engage with the public and enthuse them about our underwater cultural heritage. It really helps us to do, what is for me, the most important part of archaeology – telling the story of the people and artefacts we are studying. I used “we” in that last sentence because that’s how I felt at the end of the course. The enthusiasm and passion of the team leading the course was infectious and I think we all came enthused about the project and feeling we were part of the team, not simply course participants. Thank you! The Rooswijk was a Dutch East India Company vessel which sank on the treacherous Goodwin Sands, off Kent, in January 1740. The ship was outward-bound for Batavia (modern-day Jakarta) with trade goods. The site is now protected by the Protection of Wrecks Act 1973 and all access is controlled by a licensing system administered by Historic England on behalf of the Department for Digital, Culture, Media and Sport. The ship’s remains lie at a depth of some 25 metres and are owned by the Dutch Government. The UK government is responsible for managing shipwrecks in British waters, therefore both countries work closely together to manage and protect the wreck site. The International Programme for Maritime Heritage of the Cultural Heritage Agency of the Netherlands, RCE, on behalf of the Ministry of Education, Science and Culture) and Historic England (on behalf of the Department of Digital, Culture, Media and Sport) are responsible for the joint management of the Rooswijk. An archaeological survey of the site in 2016, undertaken by RCE and Historic England, showed that the wreck site was at high risk. As a result, a two-year excavation project began in 2017. Wrecks such as the Rooswijk are part of the shared cultural maritime heritage across Europe and it’s important that cultural heritage agencies are able to work together to ensure that sites like this are protected, researched, understood and appreciated by all. The project involves an international team led by RCE in partnership with Historic England. MSDS Marine are the UK Project Managers for the project.